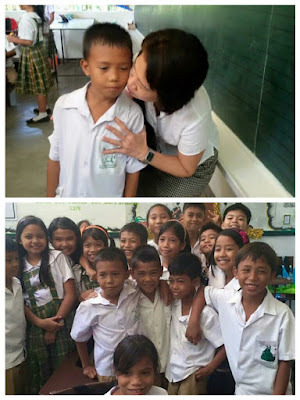 TF Donor Ana Gonzaga-Layaoen of ABC Sunnyvale Child Care in California, asked a good friend, Mrs. Joy Pastoral, to meet her scholar AJ last July 21 at St. Francis of Assisi School in Silay City. Mrs. Pastoral brought the shirt and the toys she sent for AJ. 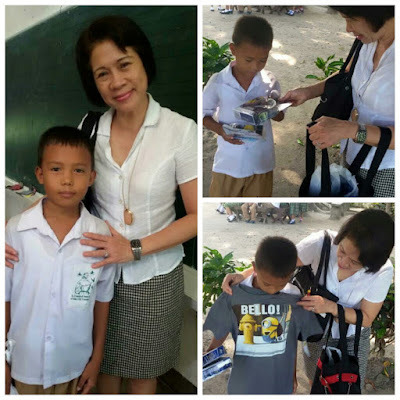 Mrs. Layaoen was the first donor to choose a scholar during our 60 Scholar in 30 Days Challenge campaign, which was launched last April 1, 2015. "The opportunity of visiting SFAS and seeing AJ, made me remember the saying, Kindness begets Kindness. We can make a difference in the lives of others when we remember the kindness we received from other people. Let us pay it forward," shares Mrs. Pastoral. "When I was growing up as a child, my mom would bring me to the orphanage and I enjoyed helping out and being around with children. I sincerely love and enjoy giving someone the opportunity and the chance to fulfill a part of their dreams, and will continue to help others." shares Mrs. Layaoen.